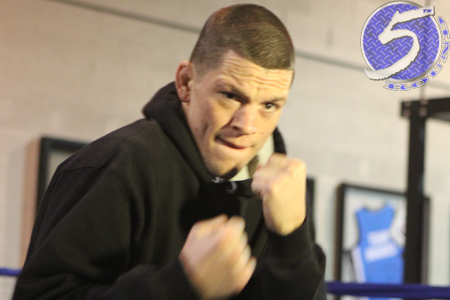 Nate Diaz (pictured) is sick and tired of fighting for peanuts. However, the UFC lightweight suddenly appears to have a serious case of the munchies for some peanuts. Diaz was in Baltimore this weekend to corner teammate Yancy Medeiros at UFC 172. During his trek to the east coast, UFC president Dana White says the controversial 29-year-old is ready to get back to work (for the measly pennies he’s compensated – if you were to ask Diaz). Diaz hasn’t been seen since posting a vicious TKO victory over Gray Maynard in November. However, Diaz was heard from earlier this month going on an extended rant with MMAFighting about his disgusting UFC contract. His win over Maynard was his first in three fights. White previously stated Diaz is in no position to demand a new deal on the heels of a run like that. In addition, White said Diaz can complain all he wants, but he makes nothing riding the pine. So, it appears Diaz is ready to scrap again. At least, this Diaz is. Big brother Nick, on the other hand, also recently requested a hefty raise – to the tune of $500,000 per fight. He’s lost two straight scraps and won’t see that kind of money in a comeback bout. White claims Nick is still sitting pretty from the fat paycheck he banked from challenging then-welterweight champ Georges St-Pierre at UFC 158 in his last outing. Therefore, no urgency for Nick to rush back to action.